What I disliked: the getto-like white-managed places on the lake Malawi and the total domain of the cell phone company when people don't even have the electricity in the house, but the cell phone! It was a hassle-free crossing the one from Chipata to Lilongwe. After the custom it's few minutes drive by shared taxi to Mchinji, from where frequent minibuses in 1h travel shuttle to the capital. Lilongwe turned out nicer than Lusaka, nevertheless, as we did, you might prefer to save the time for the Lake Malawi. In fact we reached Salima in 3h bus, where we got dropped off in the darkness then using our flash-lamp to find the way to the essential but friendly Mwambiya Lodge (16$ for a double). The next day we left our backpacks here venturing to Senga bay. Frankly we freaked out being once again packed like hell in the back of the pickup and taking more than 1h to cover the only 30km. Senga bay didn't particularly impressed me and on the beach I didn't feel at ease, even if the lake is still a must-to-be-seen highlight. We had a rest at Cool Running lodge, surely a pleasant place but with a kind of white men ghetto feel. Hence we fed up quite quickly, and jumping from one crowded minibus to a stinky other in Salima, Balaka and Liwonde, after 5h we were pulling into Mangochi. This nice small town somehow reminded me Chipata in Zambia; with its real African vibe and rightly sized between a city (usually dangerous and chaotic) and a village (usually just a street with nothing to do). In addition Mangochi is settled on the lush green bank of the Shire river effluent of Lake Malawi; the last but not the least here we saw the first historical monument of the trip, the Queen Victoria Tower Clock placed at the centre of the main roundabout! The road, snaking on the mountains, is very scenery, but don't expect to enjoy, since you'll be busy struggling to defend the room for your legs. at the end we did few km's, and everything went amazingly smoothly. Again we thought we had seen everything, but once arrived in Chiponde we had literally been assaulted by a crowd of young taxi-bike drivers begging to be recruited to take us for the 3km's left up to the border. After being given the stamp out of Malawi we picked two drivers and along the dirty red road in the most rural area we have passed, we enjoyed the most impressive leg of the whole travel. 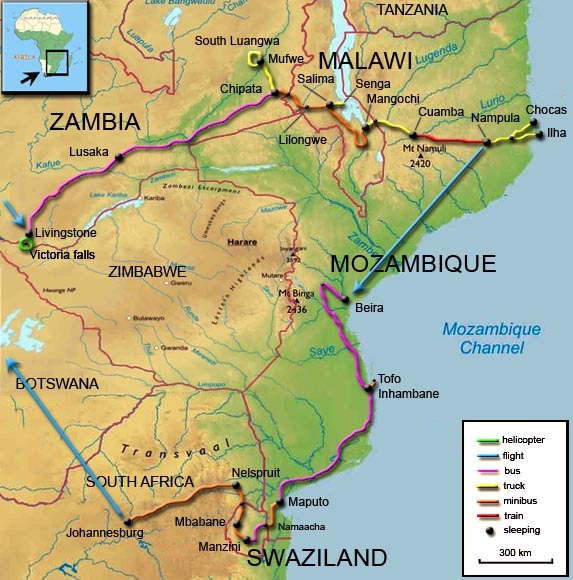 Surely helped by the fact that we just quickly crossed the country in few days, Malawi didn't particularly impress me. It's a tiny country with this huge lake, however difficult to enjoy unless you don't hire a boat. Hence I left the country with a kinda of impression Malawi's mainly a jumping point for travelling in the nearby countries, though the short distances, the cheapness (at least compared to Zambia) and the friendly English-speaking locals make the travel in Malawi easily enjoyable like being in South-East Asia. I took Lariam against Malaria, mainly due to the part of the travel in Mozambique; having a mosquito net, wearing long pants, long sleeve shirts and abounding with insect repellent, you can avoid the famigerated Lariam profilassys. Take into consideration to buy Malarone instead of Lariam, although it's a daily dose (Lariam weekly) and more expensive, it doesn't give Lariam side effects. For sure one of the most charming and convenient way to travel in Malawi is by the weekly Ilala ferry connecting Monkey Bay (in the south) to Chilumba (in the north). It makes 13 stops and the whole trip takes around 3 days. By Ilala ferry you can cross the lake passing from Malawi to Mozambique or viceversa without having to skirt the whole lake. Unfortunately the schedule did not fit at all with our timeframe so we could take it.